Introduction EMSL Analytical holds an exclusive license to the patented FBAS technology. Most analytical techniques for asbestos in soil quantify asbestos content in terms of percent asbestos in the bulk material. This metric however provides limited information about the health risk associated with the asbestos present. A given percentage of asbestos may represent a small number of large chunks of asbestos in a sample or, conversely it may represent an extremely large number of highly respirable fibers. The fluidized bed asbestos segregator (FBAS) is an instrument that liberates respirable fibers from soil by air elutriation and then captures those fibers onto a filter for analysis by transmission electron microscopy (TEM). Air elutriation is a process that separates particles based on size, shape and density using a carefully controlled stream of air flowing through the sample in the opposite direction of sedimentation. Asbestos fibers that are liberated in the air above the elutriation process are captured onto filters by isokinetic air sampling and subsequently analyzed by TEM analysis. FBAS Level A (100,000 s/g) – This level is the most cost effective target sensitivity for general information on asbestos fiber releasability. FBAS Level B (<50,000 s/g) – This level is a typical standard and suggested approach that strikes a balance of increased sensitivity and affordability. FBAS Level D (<6,300 s/g) – This level is one of our most advanced options with a very low target analysis sensitivity established by the U.S. EPA, which is used in risk assessment on an asbestos superfund site. To learn more about fluidized bed asbestos segregator testing services, contact Rob DeMalo or Ed Cahill at (800) 220-3675. 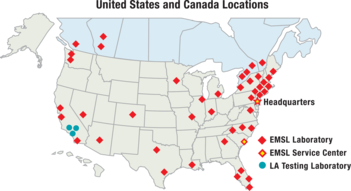 To view a complete list of EMSL’s laboratory locations, accreditations and capabilities, please visit www.EMSL.com. For more information about EMSL’s testing services, please email info@EMSL.com or call (800) 220-3675.